It’s an exciting experience for any space geek to watch a new satellite launch into orbit. Even through an online video feed, it’s thrilling to see something that Earthlings worked for years to create headed for its new home, to be our newest eyes on the Universe. These launches don’t happen so often, especially for astrophysics missions, where we see the launch of a new observatory every few years at most. Earlier in 2012, we were excited about the launch of NuSTAR, a small explorer X-ray mission collaboratively created by teams at Caltech, NASA, and over a dozen other institutions around the world. NuSTAR advances the international astronomical community’s ability to observe some of the hottest, densest, and most energetic objects in the Universe. Its detectors are sensitive at significantly higher energies than other X-ray observatories such as Chandra and XMM-Newton, giving astronomers a chance to extend the range of data they collect. During its mission lifetime, NuSTAR will conduct a survey for massive black holes, study the particles accelerated in active galaxies, and observe the remnants of exploded stars and the chemical elements they’ve left behind. 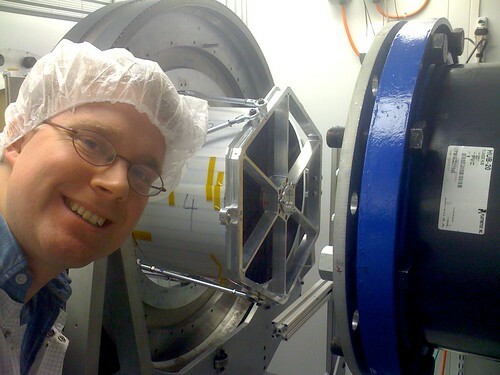 We were interested to find out more about NASA Goddard’s involvement in the mission, so we interviewed post-doc Dr. Dan Wik about his work with the satellite’s optics and his interest in observing galaxy clusters with NuSTAR.